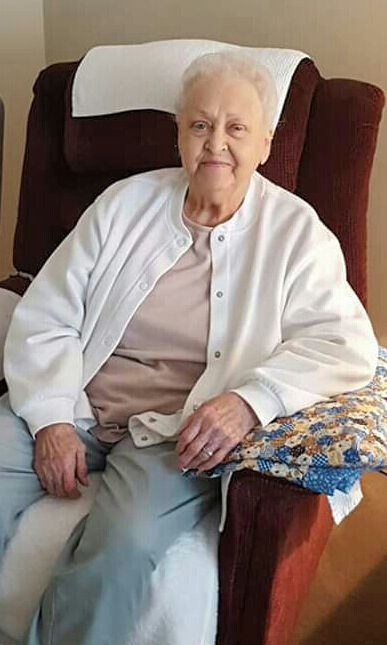 Joan Winks Fitzgerald, 87, passed away February 6, 2019, at 7:06 am, Lima Memorial Health System, with her family by her side. Joan was born January 26, 1932 in Lima, OH, to Robert Wayne and Bernice (Ridenour) Winks who both preceded her in death. Joan married Louis Fitzgerald on January 19, 1952 they shared 65 years of marriage, he passed on September 24, 2017. Joan graduated from Lima South High School. She worked at A & P grocery as a meat wrapper while raising her four children and being a housewife. Some of her hobbies were gardening, ironing, cooking, baking cookies and her famous cream filled four layer cakes, peanut butter fudge, noodles and she loved a good picnic. She loved spending time with her grandchildren better known as her “angel babies”. Joan is survived by her children, Michael (Sue) Fitzgerald of Lima, OH, Vaughn Eugene (Dianna) Fitzgerald of Corona, CA, Karen Sue (Pat) Wallace of Noblesville, IN, sister, Dorothy Griffiths, grandchildren, a special grandson who they helped raise like one of their own, Jon (Ashley) Musser, Julie Fitzgerald, Amare (Amy) Atwell, Jaquline, Shawn, Heather, Krissy Deluca, Emily Morton, Amanda Pedraza, Ryan, Nathan, Morgan, Madison Wallace, great grandchildren, Michaela Fitzgerald – Ryan, Austin Deluca, Blake Deluca, Kellan Morton, Kieran Morton, Tyler Musser, Kaden Musser, Kyndryk Musser, Killian Musser, Braxton and Maddox Pedraza, Daisy Beam, Lilly Beam, Emila “Emmy” Wallace, great-great grandchildren, Elleana Moore, sister-in-law, Florence Cole, brothers-in-law, Delmar, Larry, and Bruce Fitzgerald and many nieces and nephews. She is preceded in death by her daughter, Jill Lynn Hunt, siblings, Robert Wayne Winks, Betty Goble, Madeline Adams and granddaughter, Dianna Fitzgerald. Funeral Services will be held on Saturday, February 9, 2019 at 12:00PM at CHILES-LAMAN FUNERAL HOMES, EASTSIDE CHAPEL. Pastor Megan Croy to officiate the service. Burial will be in Memorial Park Cemetery following the service. Visitation will be on Saturday, February 9, 2019 from 10:00AM to 12:00PM at the EASTSIDE CHAPEL. Memorial contributions may be made to Putnam County Hospice, 575 Ottawa-Glandorf Rd #3, Ottawa, OH 45875 or donors choice. The family would like to extend their appreciation to Lima Memorial Hospital ICU and Putnam County Hospice staff and residences at Burton Ridge and Shawnee Manor and also her stays at Mercy Health.